(CNN) -- President-elect Barack Obama unveiled a diverse group of nominees Friday to round out his Cabinet and economic team. Rep. Hilda Solis is seen as a strong advocate for working men and women by organized labor. 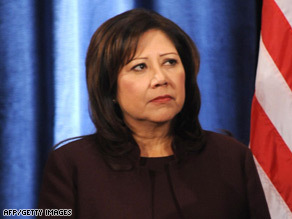 At a news conference in Chicago, Illinois, Obama nominated Rep. Hilda Solis for secretary of labor. She is a four-term Democratic congresswoman from Los Angeles, California. He also nominated Republican Rep. Ray LaHood of Illinois as transportation secretary, venture capitalist Karen Mills to head the Small Business Administration and former Dallas Mayor Ron Kirk to serve as U.S. trade representative. "Together with the appointees that I have announced, these leaders will help craft a 21st century economic plan with the goal of creating 2.5 million jobs and strengthening our economy," Obama said. Obama said he is "confident the department of labor will stand up for working families" under Solis' watch. "Hilda has always been an advocate for everyday people ... a champion of the middle class." "[She is] blazing new trails every step of the way," he said. "I am humbled and honored," Solis said. "As secretary of labor, I will work to strengthen our unions." Friday's news conference came just hours before Obama heads to Hawaii for a vacation with his family. Labor unions and political observers praised Obama's selection to head the Labor Department. On Friday, Harold Meyerson, editor at large of the American Prospect, wrote an opinion piece in the Los Angeles Times praising Solis' experience with labor issues in her Los Angeles district. "[She's] a product and champion of the labor movement, a staunch environmentalist, an ardent feminist and one of the gutsiest elected officials in American politics. Solis personifies the best of the new Los Angeles," he wrote. Andy Stern, president of the Service Employees International Union, said in a news release Thursday, "The daughter of two immigrant workers and union members ... she will be a secretary of labor working men and women can finally count on to stand up and fight for them." Obama has enjoyed the support of organized labor since the campaign season, when the AFL-CIO, the nation's largest labor organization, endorsed him for president, calling him "a champion for working families." As a senator, Obama co-sponsored the Employee Free-Choice Act, which was designed to make it easier to create unions in the workplace. Supporters of the plan, including the AFL-CIO, said it would increase the number of union members in the United States and lead to better wages and benefits for workers. Solis would be the third Hispanic to serve in Obama's Cabinet, along with New Mexico Gov. Bill Richardson, who is Obama's choice for secretary of commerce, and Colorado Sen. Ken Salazar, whom Obama picked to be secretary of the interior. Solis served eight years in the California legislature and also worked in former President Carter's administration. Solis unseated former Rep. Matthew Martinez in a bitter Democratic primary in 2000. Obama said LaHood has "fought to improve mass transit and invest in our highways." "I said I was committed to finding the best person for the job regardless of party," he said. "Ray's appointment reflects that bipartisan spirit." LaHood said Friday that improving the roads and bridges, which are a key component of the nation's transportation system, will be a priority for him. "We cannot stand by while our infrastructure ages and crumbles," he said. LaHood, a seven-term congressman from Peoria, Illinois, is respected on Capitol Hill, and his appointment as transportation secretary was hailed by both sides of the aisle. Current Secretary of Transportation Mary Peters hailed Obama's nominee. "Congressman LaHood's broad experience and well-known pragmatism make him an excellent choice to lead and support America's transportation future," she said in a statement. "I'm confident our nation's transportation network will be in good hands under the leadership of Congressman LaHood." But Politico.com's Jim VandeHei told CNN that LaHood is "interesting, because it's sort of saying, 'This is my bow at bipartisanship.' "
"But the truth is in Congress, he was the Republican that irritated Republicans most because he was always bellyaching about the performance of Republican leadership and Republican orthodoxy. So that won't soothe a lot of his Republican critics," VandeHei added. LaHood, 63, represents the Illinois district that includes the counties represented by Abraham Lincoln when he was a representative from 1847 to 1849. He is a member of the influential House Appropriations Committee. Obama also heaped praise Friday on his U.S. trade representative selection. "As mayor of Dallas, Ron [Kirk] helped steer one of the world's largest economies. He's seen the promise of trade and also its pitfalls. And he knows there's nothing inconsistent about standing up for free trade and standing up for American workers," Obama said. Kirk, 54, served Dallas from 1995 to 2001. News that Mills is slated to be Obama's next Small Business Administration head was met Friday with praise. Mills is currently president of MMP Group in Brunswick, Maine. She was a founding partner of private equity investment firm Solera Capital in New York. Her appointment will be subject to confirmation by the Senate. "With Karen at the helm, America's small businesses will have a partner in Washington helping them create jobs, spur growth in communities across this country," Obama said Friday. CNN's Ed Hornick and CNNMoney.com's Emily Maltby contributed to this report.